Sanitizing text, redirecting users, and preventing cross-site scripting attacks. Drupal Association Executive Director Megan Sanicki reveals some stats on who is contributing. Before you stop billing your time to a web project, better take care of some final security tasks. How to convince your clients that security really matters. Data protection and privacy laws vary from region to region. We'll help you get started understanding the baseline issues. Prevent attack bots from logging in to your site. A trick for accessing an Apache web server without a fixed IP address. 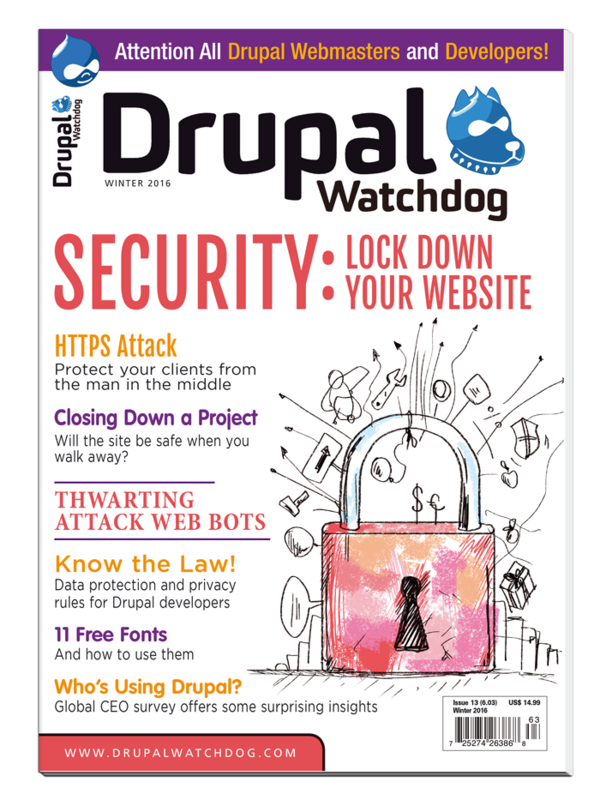 Authenticating users across Drupal sites. Control the behavior of search engines indexing your site. Secure HTTP might be less secure than you think – find out why! Discover what kinds of companies are opting for Drupal. The Drupal community converges on Australia for three days of learning, hacking, and fun. A minimum viable project approach to data science. We look at some free-licensed fonts available for Drupal environments. Collecting data is easy; interpreting is where the problems start – unless you proceed carefully.